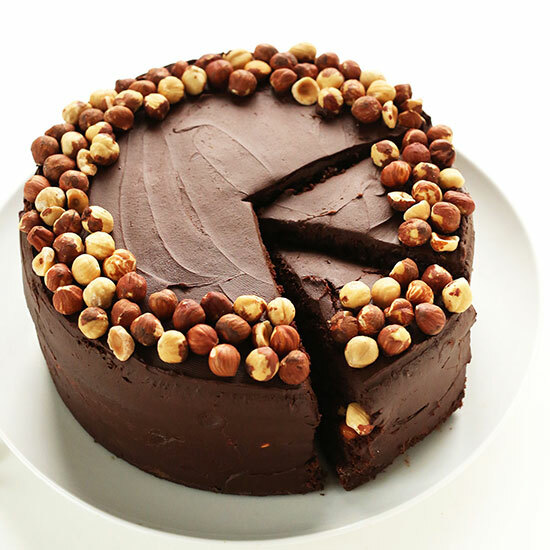 AMAZING, rich chocolate hazelnut cake made in just 1 bowl! Entirely vegan and gluten-free and so simple to make. Perfect for every day or birthdays and special occasions. Preheat oven to 350 degrees F (176 C) and butter two 8" round cake pans (or line 24 muffin tins with paper liners // as original recipe is written // adjust number/size of pans if altering batch size). Dust with gluten free flour and shake out excess. Measure out almond milk and add vinegar. Stir and let curdle while moving onto the next step. Add the sugar, maple syrup and almond milk mixture to the flax egg and beat/whisk to combine. Then add applesauce, vanilla, melted coconut oil, salt and mix. Add cocoa powder, almond meal, oat flour and gluten free flour and beat/whisk to combine. If the batter appears too thick, add a touch more almond milk, but it should be perfect. It should resemble a semi-thick batter that’s pourable. Divide batter evenly between cake pans (if using muffin tins, it should be enough for roughly 24 filling generously 3/4 full // amount as original recipe is written). Bake cake for 35-45 minutes or more (cupcakes for about 29-35 minutes) or until a toothpick inserted into the center comes out clean and the top appears dry. Time will vary if you sub ingredients, as well as depending on the size of your pan. Let rest in the tin for 15-20 minutes, then carefully run a butter knife along the edges and invert onto cooling racks. Let cool completely. Immediately add chocolate to warm milk but don’t touch for 3 minutes so it can melt. Stir with a wooden spoon to incorporate, then add coconut oil or softened butter and cover. Let rest untouched for another 10 minutes. Use your mixer (or a whisk) to beat the mixture together. Then add 1 cup powdered sugar, mix again, and place in fridge to set for 20 minutes. You’ll know it’s ready when you tip it and it’s slow to move. Remove from fridge and beat again. If it’s still too thin, add another 1/4 - 1/2 cup powdered sugar (amount as original recipe is written // adjust if altering batch size) and beat until light and fluffy. I found that adding 1 3/4 cups total powdered sugar (amount as original recipe is written // adjust if altering batch size) was perfect. Set aside. Transfer the bottom layer of the cooled cake to a serving plate/dish. Spread a semi-generous layer of frosting on the top of the bottom layer and top generously with hazelnuts. Press down with hands to settle them into the frosting (see photo). Carefully top with second layer and frost the top generously, then the sides. Using a butter knife yields a smooth surface. It should be the perfect amount of frosting - not too thick, not too thin. Add hazelnuts around the perimeter of the top of the cake. Slice and serve. Will keep well-covered at room temperature for several days, though best when fresh. Refrigeration not necessary. *For this cake, I used the Bob's Red Mill 1:1 gluten-free flour blend. However, my DIY gluten-free flour blend works well, too!